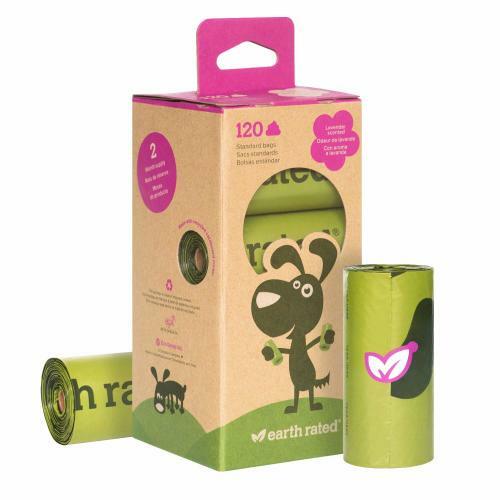 Earth Rated Lavender Scented Biodegradable Poop Bags are extra strong and 100% leak proof. What's more, they're big enough to fully cover your hand and sleeve during pickup, allowing for plenty of room left over to tie a secure knot in the bag when you're finished. EPI Additive Breaks it Down: This additive renders our bags oxo-biodegradable, while staying strong to get the job done! Packaging and Roll Cores Made with Recycled Materials: Reduce, re-use and recycle! The three Rs never looked so good! Lavender Scented: Poop smells like... well, poop. Our dog bags are lavender-scented so you can smell awesomeness instead. Who wouldn't want that? !